Occasionally, I get to build recipe roundups which highlight ingredients that could be offered in a CSA or it could just be a seasonal meal that allows me to show off a bunch of different recipes. This is fun in the sense that I get to look at a lot of different recipes that may use a particular ingredient I'm trying to highlight at any given time. 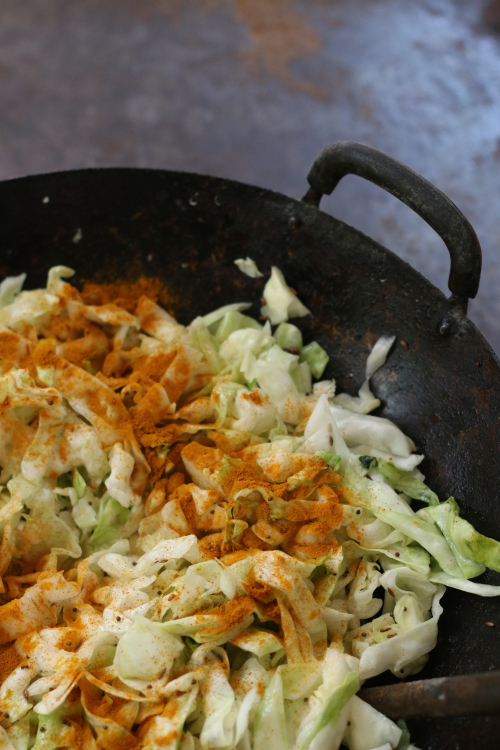 This past week cabbage was one of those ingredients, and when I stumbled upon this recipe for gujarati cabbage over on Saveur I knew it was one I was going to have to try — and I didn't waste time! In reviewing the recipe, and going down the list of ingredients, I actually hesitated to highlight this particular recipe. Most people (myself included) do not have fresh curry leaves, black mustard seeds and asafetida as staples in their fridge or pantry. I am still not even sure what asafetida even really is, but with all of these aromatic spices and chiles it was a dish I had to try. After tweeting to ask where to find fresh curry leaves in #rva and getting some really good ideas, I headed to Laxmi Palace and got an education on asafetida, which I quickly learned a little goes a long way and it helps with digestion. 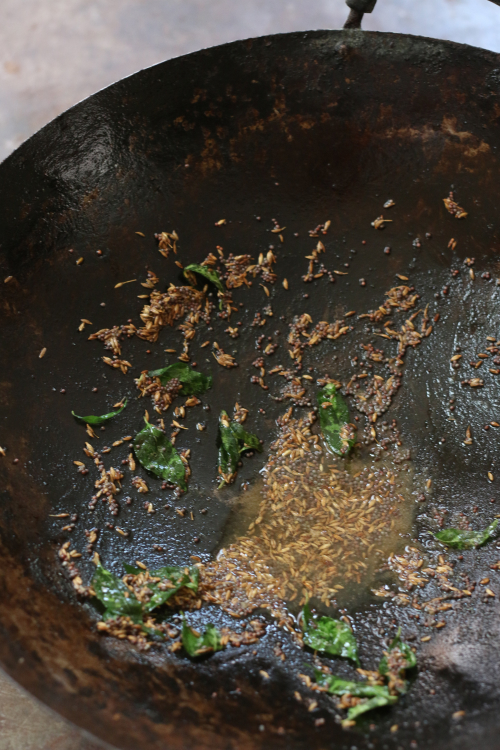 So bringing everything home — asafetida, curry leaves, cumin and mustard seeds, I got cooking with the wok and a journey of smells in the kitchen began. 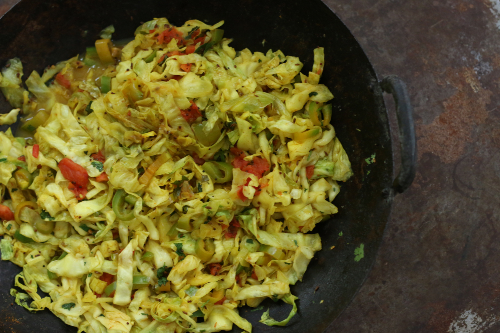 Adding cabbage, turmeric and cilantro I was quickly taken to a far-off land that dazzled my senses. 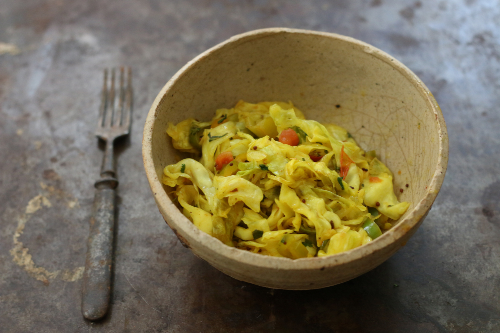 The turmeric of course turned the cabbage a warm yellow, which added to the beauty and savory tastes of this dish. Well, how was the dish and what does asafetida taste like? 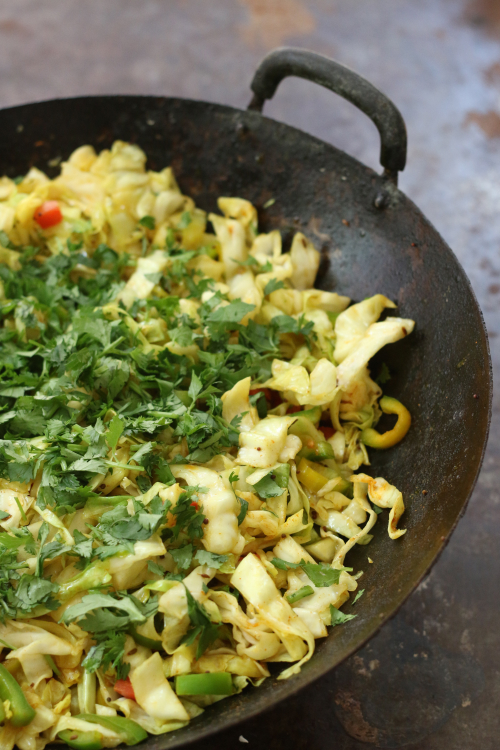 As expected, the cabbage combo is a party in your mouth with many things going on and although the aroma of asafetida continues to lurk in the kitchen, the turmeric, curry leaves and mustard seed are the most pronounced flavors on the palate. It made for a wonderful dish served warm and straight from the stove, but after tasting it later in the day I believe cold may be the way to go. 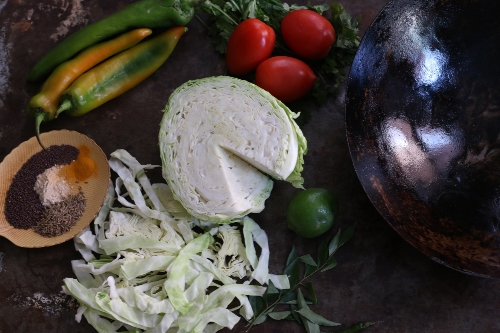 The beauty about cooking is not only the end result, but also the journey of the dish. Although running around town looking for a couple of ingredients may not be an everyday convenient occurrence, it does open the door to learning about cultures and food of a different land as this dish did for me. So what are you waiting for? 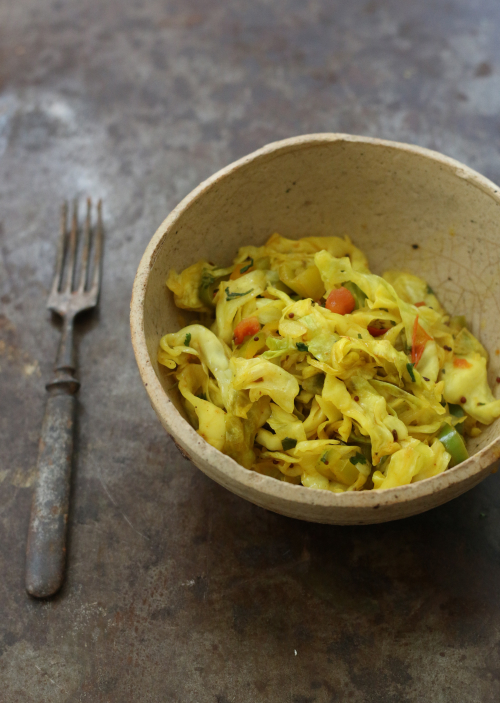 Go find some fresh curry leaves and enjoy transporting your kitchen to India with this recipe for gujarati cabbage! This sounds so good!! I love discovering new ingredients I've never heard of. Thanks Tara and yes this has some out of the ordinary pantry items but well worth getting them! I went to Laxmi yesterday, and purchased the asafetida. My aunt is in town, and has never been to an Indian grocer. She was curious about the smell, and opened the bottle. Wow! It has a distinct, and strong aroma. Yes, that stuff is quite potent! Let me know how it turns out!